KDDL president Craig Taylor presents the league singles trophy to Robbie Stanger, who beat Stevie Linklater in the final. 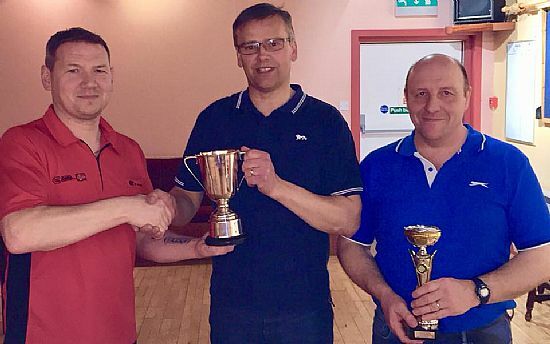 The final ranking points competition of the year took place in the Masonic Club in Kirkwall when the prestigious KDDL League Singles took place. By semi-final stage Stevie Linklater overcame Leigh Shearer, while young Steven Low's great run in the competition came to an end when defending champion Robbie Stanger proved to strong for him. Robbie then convincingly retained the title he won the year before by beating Stevie Linklater 5-2 in the final. With the ranking points competition finished, the committee and qualifiers met on Sunday when the East and team to take on Shetland were finalised. Captain: Craig Taylor. Players: Kevin Gray, Derek Firth, Ivan Leslie, Robbie Stanger, Ian Linklater, Stevie Linklater, Brian Moar, Leigh Shearer, Erlend Lennie, Ryan Tulloch, Simon Parry, Ian Findlay. Reserves: 1. Stevie Moar, 2. Brett Dickinson, 3.Neil Croy, 4.Steven Low. Non playing captain Robbie Norquoy. Players: Erlend Eunson, (vice-captain) Steven Low, Jamie Drever, Mark Shearer, Nicol Gray, Derek Ward, Lee McPherson, Gary Wilson, Neil Drever, Colin Findlay, Derrick Firth, Darryl Robertson. Reserves: 1. Ally Linklater 2. George Low, 3. Brian Murray, 4. Thorfinn Eunson. The East v West takes place in the Kirkwall Legion on Friday night at 7.30pm. A busy week in the leagues as several catch up games were played. The Legion held their top spot by beating Warriors, although the Golf Club closed the gap by beating Quoyburray and Warriors. Shapinsay lost to Wanderers but climbed above the Arrows by beating them. The Arrows also lost out to the Commodores. Elsewhere, Quoyburray 'B' battled hard but just lost to Untouchables 'A'. The Untouchables v Sanday was postponed. The Nomads have sealed promotion to the 'A' League by beating close rivals the Muppets, whilst two wins for the Bilco Boys moved them clear in second place, their highest position of the season. The Ale Stars finally broke their duck by firstly beating Sands and then drawing with three man Murray Arms, who cannot now be promoted. The Vikings won against Streamline and moved clear into third. 180s this week were hit by: Neil Croy, Graham Firth, Allan Brown, Colin Leslie, Billy Ward, Graham Reid, Ryan Tulloch, Gordon Rendall (OGC), Bruce Moar, Robert Hutchison, Gary Wilson, Derrick Firth, Lee McPherson, Colin Findlay, Ivan Leslie, Ryan Wilkie, Leigh Shearer, two each from Simon Parry, Robbie Stanger, Jamie Marwick, Kevin Gray, Derek Firth, three each from Stevie Moar and Stevie Linklater. Robbie Stanger also scored 174, while Wayne Monkman, Gordon Rendall (OGC) and Stevie Linklater all scored 177. 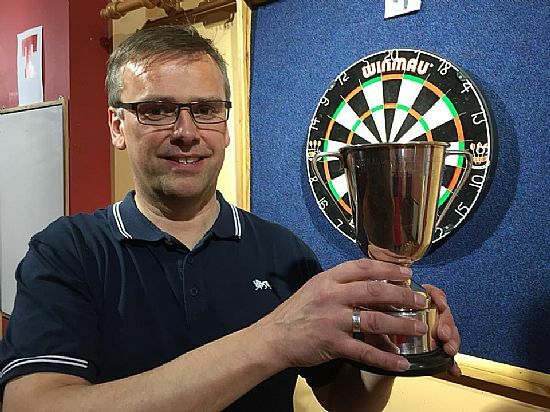 Ton-plus checkouts came from: Colin Barnett 100, Des Gillespie 100, Robbie Stanger 100, Stevie Linklater 101, Steven Griffiths 102, Derek Firth 106, Roy Griffiths 109, Stevie Moar 111, Wayne Small 113, Neil Croy 114, Colin Leslie 114, Bruce Moar 115, Trevor Shearer 117, Jamie Marwick 117, Billy Ward 126, Gordon Rendall (OGC) 153 and Brian Moar 100, 116 & 124. Legion Arrows 4, Shapinsay 8. Young Loons 4 Bilco Boys 8, Nomads 8 Muppets 4, Vikings 8 Streamline 4, Bilco Boys 8 Sanday 'B' 4, Ale Stars 6 Murray Arms 6, Sands 5 Ale Stars 7. Warriors v Untouchables, Legion v Untouchables A, Sanday v OGC, Quoyburray B v Legion Arrows, Quoyburray v Wanderers, Commodores v Shapinsay. Streamline v Sanday, Vikings v Muppets, Bilco Boys v Ale Stars, Nomads v Tankerness, Young Loons v Murray Arms. Sands - No game. Advance notice: Steven Flett Mixed Doubles, April 13, Legion, 7.30pm.